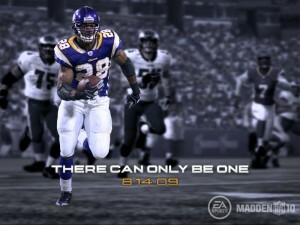 As we mentioned a few weeks back, Adrian Peterson is not likely to appear on the cover of Madden 2010. Peterson has long been thought of as a shoe-in for the gig, but as PFT points out most recently, Peterson can be scratched from the curse watch list. 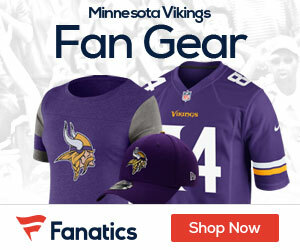 I’m not saying a curse exists, but the Vikings are going to need everything going their way this season, so the lack of a curse is one less thing to be weighing on the minds of those fans, and possibly players and coaches, that actually believe in it. Afterall, the last Viking to grace the cover of Madden was Daunte Culpepper, and we all know how that turned out. Also, Peterson himself would have had a lot more distractions as the person who agrees to be on the cover faces time consuming event appearances and endorsement sessions. It has long been rumored that some players, including Peyton Manning, have refused to be on the cover of the video game because of the demands placed on the cover athlete. PFT notes that a source told them that Peterson was offered the opportunity by EA, but turned it down. This would fall in line with comments made by Brad Childress recently where he stated in pretty blunt terms that Peterson needs to work on not committing himself to too many extra activities during the offseason. Childress would prefer not to have his superstar running back pulled in too many directions, which is understandable, and be able to continue to focus on football throughout the offseason. I still think Larry Fitzgerald will end up on the cover of Madden 2010.